New boss Claude Puel began his Leicester reign with a routine win over managerless Everton as the Foxes eased away from trouble. Jamie Vardy and Demarai Gray clinched successive wins for the hosts and sealed a 2-0 victory over the struggling Toffees. 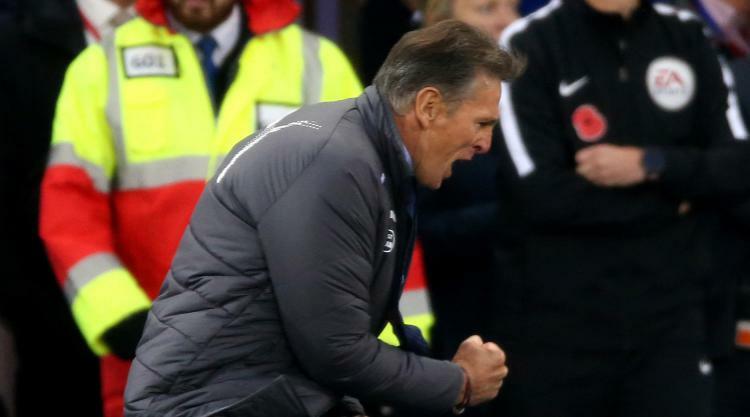 Puel was only appointed as Leicester manager on Wednesday but his new side made light work of powderpuff Everton, who remain in the Premier League relegation zone, to move up to 11th. The Toffees' troubles grew when they were denied a penalty after Aaron Lennon was fouled and they are in desperate need of direction with caretaker manager David Unsworth unable to inspire a change. Everton were the visitors on the final day of the season in May 2016, less than 18 months ago, after which Leicester lifted the Premier League trophy. Since then the pair have changed managers twice and have both gone backwards - with the Toffees still to permanently replace the sacked Ronald Koeman after spending around Â£150million in the summer. With Leicester a step ahead, having appointed Puel as Craig Shakespeare's replacement, they took the early initiative. The recalled Gray drilled wide before skipper Wes Morgan's blast was deflected over and Chilwell scooped off target during a lightning start by the Foxes. Everton, with just two league wins this season, struggled to respond and found themselves behind after 18 minutes. Leighton Baines' free-kick was cleared to Gray and the winger put on the afterburners to leave Idrissa Gueye and Tom Davies trailing during a barnstorming 60-yard run. He found Mahrez who, in turn, crossed for Vardy to bury his sixth goal of the season from five yards. Tails up, the Foxes went for more and Jordan Pickford saved Ashley Williams' blushes by claiming Mahrez's effort after Williams lost the ball. The pace of Gray, Mahrez and Vardy terrorised the ageing Everton defence but it was one of their young guns who inadvertently helped double Leicester's lead after 29 minutes. There seemed little danger from Gray's routine cross but Kenny, starting just his second league game for the Toffees, horribly sliced his clearance past the stunned Pickford. The goal was given to Gray - his first Premier League strike in over a year. But Everton should have been awarded a penalty after 31 minutes when Aaron Lennon was fouled by Christian Fuchs yet referee Andre Marriner denied them a lifeline. The visitors regrouped and began the second half brightly after the introduction of Beni Baningime and Oumar Niasse for Lennon and Kevin Mirallas. But they still failed to test Kasper Schmeichel despite bossing possession, with Leicester happy to sit back, and the ineffective Wayne Rooney looked unhappy at being replaced by Gylfi Sigurdsson. The Foxes remained comfortable, enough to substitute Mahrez, with a more physical second half and Vicente Iborra should have added a third late on but poked wide.